I’ve been obsessed with mid-century modern, way before the phrase was coined. 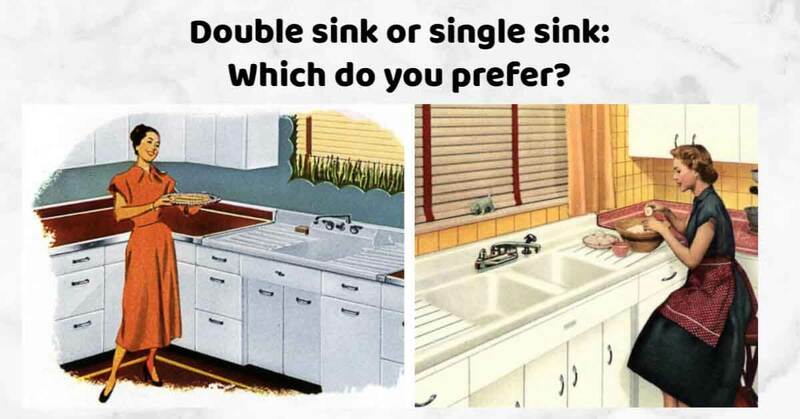 I’ve studied a ton of vintage advertising, and I instantly recognized this sink. Those tiny little holes in the back were used for the pop rivet that held on the applique on the backsplash. This is where it gets complicated. 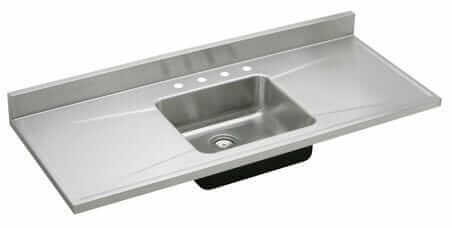 Not to say anything negative against this sink, but it wasn’t manufactured as high-end. 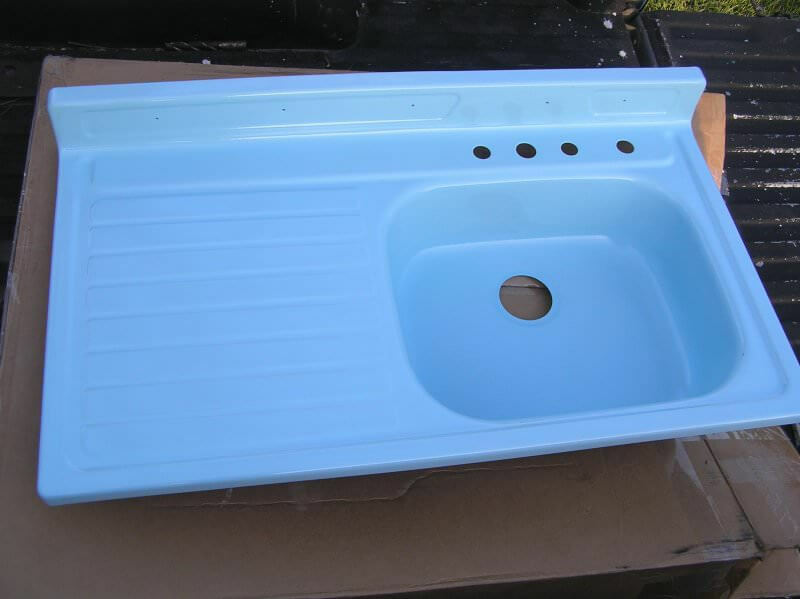 Major sink manufacturers would contract with appliance manufacturers or plumbing supply houses and make no-name sinks. After the sinks were made, depending on the order specs, either stylized metal appliques were pop-riveted on, or the appliance manufacturer’s emblem was installed. I’ve seen a ton of these featured in advertising for GE and Hotpoint kitchen appliance bundles, which were normally supplied to home builders. The present owner will have no problem solving this issue – he merely has to find a local sheet metal fabricator, who can make and install metal appliques for the backsplash. Old-fashioned pride in workmanship coming into play there! 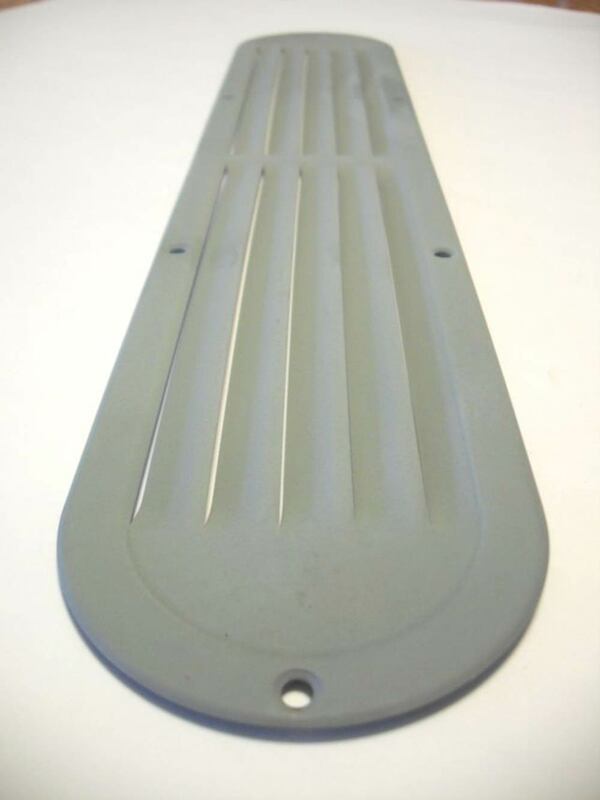 You should check out how they used to attach metal trim to cars before the 1970’s – pop rivets and spring steel clips – before they decided a couple of dabs of glue was “good enough” (which it wasn’t). It looks as if Robert has been supplied with only a couple of choices to proceed: either it’s for faucet and accessories (sponge/soap dish) or an applique. If you’re going the faucet route, don’t only think vintage but check industrial/institutional sinks for something to adapt. If you’re fabricating appliques – whoo-boy! Customize it to your heart’s content! Make a few to pop in and out according to holidays, etc. Instead of metal, have it 3D printed – ?! Check your local high school/technical college to see if they have a printer – nice school project. There are even some public libraries with 3-D printers available to the public now. Robert here. Thanks to all who replied. The holes are 1/8th inch in diameter. I will come up with some sort of decorative elements for the back splash of my sink. Not sure exactly what, but right now, if I can’t find pictures of the originals that will free me to get creative. I do have 5 fired-enamel European car badges from the… ’60’s? They are styled like coats of arms, and are from; Holland, Paris, Spain/Portugal, Lichtenstein and Madrid. They appear to be fired enamel over brass. I just might put them onto the backsplash just for color and pizzazz. I have seen quite a few of these sinks first hand and most were date stamped 1955. I have on the other hand never seen this style sink hole punched on the backsplash. If one was curious as to whether the holes were original or were drilled after the fact there would be a way to tell. All holes (faucet, drain, etc.) 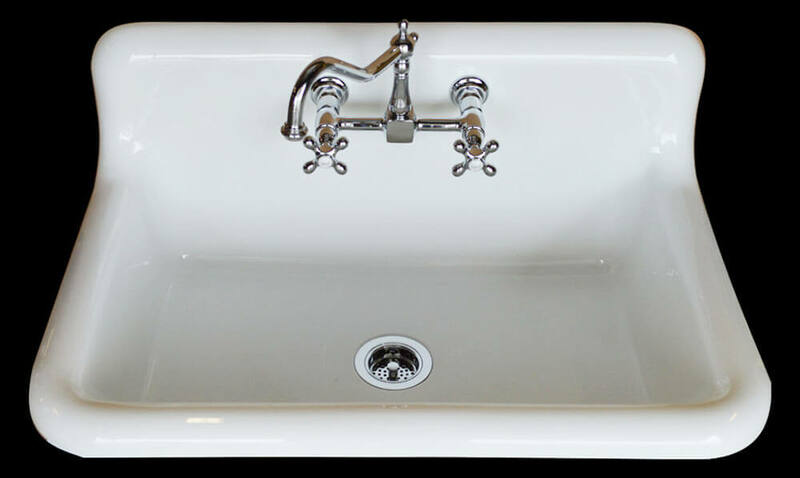 are punched prior to the sink being enameled and fired otherwise any attempt to punch or drill these holes after firing would result in a chipped or jagged enamel edge. So if the original enamel was smooth around the holes prior to any subsequent refinishing or reenamaling these would have been placed by the manufacturer. While the mystery remains unsolved I hope this helps. Not to go off subject but one other thing to keep in mind about this sink when shopping for a faucet is that the three faucet holes are spaced 3.5 inch on centers rather than the more common 4″ on center spacing.